You have told me, you miss my physics posts. I have missed them, too, and I give it a try. But I cannot help turning this into a cross-over again, smashing together half-digested psychology, physics, IT networking, and badly hidden autobiographical anecdotes. In 2005 I did research on the incorporation of physics-style thinking and mathematical models into non-science disciplines. Actually, it was a small contribution to an interdisciplinary research project, and I have / should have covered science-y ideas related to how revolutionary new ideas percolate society. In retrospect, my resulting (German) paper was something in between science writing, thorough research including differential equations in detail – and some bold assumptions, partly inspired by popular science, cliché and science fiction. Probably like my posts, but more long-winded and minus the very obvious rants. I built on my work in laser-materials processing, superconductivity, phase transitions, and I tried to relate chaos in thermodynamic systems and instabilities in fluids with related non-predictable diffusion of ideas. Simulation of Rayleigh-Taylor instabilities at the interface of fluids with different densities. You could probably test this with Caffe Latte. Many networked structures obey very similar rules. Networks of WWW hyperlinks, citations scientific papers, food chains, and airline networks are called scale-free networks, because the distribution function for the number of links follows a power law. A small number of nodes has a high number of connections and the structure the networks appears the same on every scale applied – it is self-similar. The power law is only valid for ever growing networks. Network following a power-law distribution of connections. The backbone of the network is established by a few strong, well-connected nodes, and the vast majority of nodes has only a few connections. The dynamics of such networks could be modeled using the same math as esoteric Bose-Einstein condensation, which allowed me to combine anything and relate networks and the quantum phenomena in superconductors. 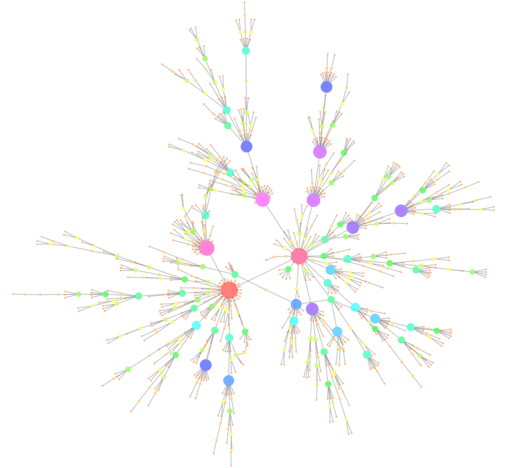 But the basic idea is really simply: The more popular nodes attract more links. This is a winner-take-all model. Companies have started monetizing network research by analyzing and modelling hidden structures and unveiling the the fabric underlying politics and economy. Re-visiting that old article of mine I spot an application of physics in something-else-dynamics I have missed: One of the classical non-academic jobs for a (theoretical) physicist is Wall Street quantitative analyst or quant. Quants for example apply models taken from thermodynamics, such as diffusion in supernovas, to the finance world. an assistant professor of logic and philosophy of science at the University of California, Irvine, has two Ph.D.’s — one in physics and mathematics, and one in philosophy. The book gives an overview of different models that resemble physics or are borrowed from physics – such as the Black-Scholes model that uses Brownian motion to model the dynamic development of prices of derivative financial products. Don’t ask me for details – I am just dropping keywords here. Weatherall wants a new Manhattan Project to determine what’s wrong with economics, and he thinks it should be based in no small part on the contributions of physics-oriented economists, some of whom he believes have been treated unfairly by the establishment. In my outdated review article I finally came to the conclusion that some aspects of seemingly complicated systems – including those based on human beings – can be modeled using models of a baffling simplicity in relation to the alleged complexity of human nature. I am not ashamed of pointing out this glaring contradiction with my recent posts on gamification. Taleb speaks to me – in particular his chapter about Ludic Fallacy. I do enjoy the clichéd characters of Fat Tony, the intuitive deal maker who hacks the real world, versus Dr. John, the nerdy engineering PhD who is fond of building mathematical models. I took all my self-irony pills in order to recover. How could I not remember my indulgence in this diagram proving the braininess / nerdiness of physicists (and philosophers) – and my straight As of course. Did I mention that I am not a high-powered executive today or an accomplished professor? So it is Dr. Jane speaking here. How could I not remember those enlightening anecdotes in David Goleman’s pop-psychology bestseller on EQ – emotional intelligence, first published in 1996. He told the story of two equally gifted students of mathematics, one becoming a rock star scientist, the other one becoming a mere computer consultant. I have read this book in German, so I will not give you a verbatim quote translated back to English. Actually, Goleman said something like: He pretended / claimed to be happy as a computer consultant. It says a more about me than about Goleman that I can quote this from memory without touching the book. I could say a lot of things about the notion of pretense here, but I will not repeat my most recent loosely related rant. Goleman and Taleb both agree on the overarching role of intuition, thinking outside-the-box, gut feeling or whatever you call this. Luckily, Taleb is not concerned so much with proving which part of the brain is responsible for what because this is the part of pop-psy books I find incredibly boring. Nobody in his right mind would disagree ( …. with the fact that interpersonal skills are important, not with my judgement of pop-psy books). Even I tend so say, my modest successes in Mediocristan are largely due to my social skills whereas technical skills are needed to meet the minimum bar. Mediocristan is Taleb’s world of achievements limited by natural boundaries, such as: You will not get rich by being paid on time and material. You might get rich in Extremistan, as a best selling author or musician, but you have to deal with the extremely low probability of such a Black Swan of a success. I am trying my hands at Occam’s Razor now and attempt to sort out this contradictions. I believe that mathematical models of society make sense, and I do so without having read more propaganda by econo-physicists. I do so even if I will go on ranting about physicists that went into finance and caused a global crisis, because they just wanted to play with nice physics (as we said at the university) – ignoring that there is more at stake than your next research grant or paper. Models of society and networks make sense if and only if we try to determine a gross statistical property of an enormous system. This is perfect science based on numbers that are only defined in terms of statistics – such as temperature in thermodynamics. Malcom Gladwell is a master story teller in providing some convincing examples that proves that sometimes it only context that matters and that turns us into automata. For example subjects – who were not informed about the experimental setup – were inquired about their ethical standards. Would you help the poor? Of course they would. Then the experimental (gamified!) setup urged the subjects to hurry to another location, under some pretext. On their way, they were confronted with (fake) poor persons in need. The majority of persons did not help the poor, not missing the next fake meeting was the top priority. Gladwell’s conclusion is that context very often matters more – and in a simple and predictable – than all our sophisticated ethical constructs. This is probably similar to our predictability as social networking animals, that is: clicking, liking and sharing automata. People in a stadium clapping their hands will synchronize, in a way similar to fireflies synchronizing their blinking. You can build very simple models and demonstrate them using electrically connected light bulbs equipped with trigger logics – and those bulbs will synchronize after a few cycles. I believe that using and validating those reliable models we learn something about society that is not exactly ground-breaking. We can model the winner-take-all behavior of successful blogs to whom all the readers gravitate by Bose-Einstein condensation. But so what? What exactly did science tell us that we did not know before and considered trivial everyday wisdom? In particular, we learn nothing that would help us, as individual nodes in these networks, to cope with the randomness we are exposed to if we aimed at success in Extremistan. Mr. Taleb, keep preaching on! not falling for the narrative fallacy, denarrating, and ignoring TV and blogs. but yet: focusing on the control of my decisions and trying to grasp the abstract concepts of probability in every moment. 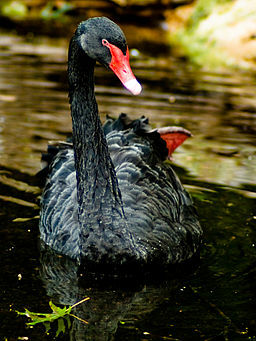 Black Swan (Wikimedia). I wanted to embed an image of Nathalie Portman in Black Swan ballet dancer’s costume, but I did not find a public domain image quickly, and I am not bold enough to do so without cross-checking copyright issues. This entry was posted in Life, Life the Universe and Everything, Physics, Science and Technology and tagged Finance, Geek, Geek Collection, Instability, Modeling, Nassim Taleb, Networking Theory, Networks, Psychology, Randomness, Science, Sociology, Technology, Writing by elkement. Bookmark the permalink. Hej Elke, another fascinating blog post. Thank you also for keeping the faith with CarnotCycle. I love the Caffe Latte analogy; it reminds me of aroma-rich, unhurried cafés where one can sit and think about things, like the sometimes-overlooked role of the spoon in entropy-increasing processes. “Have you ever wondered why so many of these straight-A students end up going nowhere in life while someone who lagged behind is now getting the shekels, buying the diamonds, and getting his phone calls returned?” I think the key here is success bias. It is true that some uneducated people get rich; it is also true that most of them end up unemployed and in misery, as it is happening in Spain right now. I recently read that the qualities that make someone overwhelmingly successful are also those which can be conductive to utter failure. Some self-made men took big risks and got huge pay-offs, true. But we never hear the story of the thousands who took big risks and failed miserably. Success seems to be such an elusive subject that trying to find a rule to achieve it seems like a lost cause. You may be able to explain some cases after they happen, but making predictions is a lot harder. Thanks, David – you have pretty much nailed it. That powerful story of the slow-learning, underdog, misfit pupil who meteorically rises to fame later in real live is a legend in its own right (in contrast to the conformist over-achieving nerds to whom their later lack of success serves well). I am thinking of: Bill Gates flunking college and Einstein having been an under-performer at school. The latter is grossly exaggerated according to throroughly done biographies. Taleb states exactly what you say and provides some empirical reseach: Those character traits attributed to the iconic winners – reckless, risk-taking, alpha leaders… – are the same traits that make the susceptible to losing – the different between big wins and big losses is just dumb luck. I want to slide an observation into this thought. Sometimes there is a gap in finding the ‘right’ answer. As a student, I was constantly challenged to give the expected response over the one which was correct or honest. We have this in all fields of study, including science and math, the so-called empirical fields. The TED talk video on statistical interpretation is another such example. People negotiate one or the other, choosing between pleasing others or following their own curiosity. The self-learner isn’t as common, I suspect. It takes a degree of risk to remove one’s self from the social group to express a difference of thoughts. I’m not sure how this fits with Taleb’s thesis, but I would argue that the person who is curious about an idea at the right time, following her/his own instincts, is more likely to become the black swan of innovative thought than the student who knew how to play the system and answered as expected. Don’t get me started about the educational system! 😉 I feel the more unpredictable, Extremistan-like our world becomes, the standardized, and follow-the-solutions-manual-and-learn-the-catalog-of-questions educational systems get. Same with our overly bureaucratic system of industry standards, policies etc. – after all, this is what school prepares you for. I just (have to) read standards on risk management, putting anything in neat little boxes. If I would not see the unintended irony this would bore me to death. Taleb is very radical: He says that it is a bad thing that school expects us to give any answer at all, if the only honest and correct answer would be: We don’t know. He ridicules in particular the explanatory narratives attached to history that we add in retrospect (What is the reason for the demise of the Soviet Union?). Yes, we call this ‘socialization’. 🙂 The only frontiers left for us to explore are the ones of thought and innovation, and once again only the strong and staunch go forth into this wilderness. Some of us get eaten by bears, but a few don’t! Have you seen Peter Donnelly’s TED talk? http://www.ted.com/talks/peter_donnelly_shows_how_stats_fool_juries.html I was thinking of it, considering the connections between the practice and theory of statistics, and Gladwell’s frequent arguments that we often fail to ask the right questions or to examine context closely enough. Thanks, Michelle, just watched it now 🙂 I like these puzzles you fail so easily. Thanks for this book link! I’ve read your post again, some parts of it more than twice. This is a really strong essay, as PMD said, good writing. I’ll probably come back to it again, as I often do your more challenging posts. You’ve also caused me to cave in and chase a trend. 🙂 I am looking at the book Black Swan and will probably read the rest of it. Usually, I resist popular things (perhaps, resisting the networking nodes on a subconscious level). Taleb’s angle on the ‘science of prediction’ is mainly motivated by his experiences as a trader and quant, and his interest in politics – the latter one influenced by his emigrating from Lebanon as a teenager, having experienced the Black Swan of the war. I believe some sort of quantitative ‘science’ is needed to run an insurance or trading company or to forecast a country’s deficit. But Taleb claims that a taxi driver with common sense knows as much about the future of politics as a political science expert. I have read Quiet and enjoyed it – the few, dull, pure neuroscience parts are forgivable, as the book offered me some eye-opening insights about myself. The Shallows by Nicholas Carr – which I praised a lot on this blog – is more unnerving here – as I would have liked to read more about his personal experience in unplugging from the internet and less about his well-researched, but second-hand knowledge of the physiology of the brain. The more researched stories a book contains, the more personal anecdotes I expect to compensate for that. I think you would like Amanda Lang’s book (another Canadian) called The Power of Why. Heavy on anecdotes, but her discussion touches on everything we’ve been blogging about these past months. Currently the Kindle version does not seem to be available – for sure some strange amazon.com / amazon.de glitch. Thanks for commenting – you are too kind! Wonderful writing. The only reference I truly understand is Gladwell, the master web builder. I always enjoy seeing him thread together disparate research data into near conclusions, though he is perhaps wise enough to leave the overall point of his writings mostly unstated. I enjoy Gladwell, too – though it seems a bit fashioanable among intellectuals to despise him as not scientific enough etc. But I believe this is common critique popular writers have to face – I have read Stephen King’s On Writing recently: an awesome book on many levels in my humble, non-expert reader’s opinion – a great blend of advice for writers and subversive autobiography resembling his novels in a subtle way. Yet on amazon some reviewers state that he only wrote this book because he struggle with being a popular, but not a good writer. King is a solid writer, but a genre writer, of immense popularity. I think his bizarre accident which almost killed him prompted the introspective On Writing. Still, I love what he says about grammar being the tool box of a writer to build a composition. Know the rules before you break them for art’s sake. The one thing that always strikes me about models vs. reality is that the social ‘things’ are so complex that it is extremely difficult to model them at all. Models work because they remove the unwanted ‘noise’ from the system but as Taleb points out, sometimes the noise is the dominant thing. Besides, even if there are no black swans, accurate models that predict social and economic behavior would be hardly less complex than the reality itself. I’m therefore really struck by that approach you outlined. No doubt the number of variables per node will have to be very high, as will the number of nodes. In the end, though, it might yield some interesting and maybe even accurate results. But still, there’s the butterfly effect… Seemingly unrelated and minor effects from the ‘edge’ of the system and therefore not likely to be incorporated into the model, could still have a profound effect on the outcome. …another type of black swan I suppose. It had struck me, too. I believe the clue is really, that these models do only work in specific setups – and it might be hard to predict which setups are like that. Gladwell had some good examples related to the power of context, I can’t remember them all. If you enjoyed Taleb, you might enjoy Gladwell, too. But I basically wrote this article as I was surprised by the conclusions I had draws some years ago. Probably I will write another contradict-myself-again-post in a year! One more thing: you really found your ‘voice’ with this post. It was thoughtful and thoroughly engaging :>) Now it’s my turn to tell you to start considering a book!